At Parlier's Riverview Elementary School on February 13, Governor Gavin Newsom signed two laws that allocate $131 million for emergency drinking water projects and wildfire preparedness. Governor Gavin Newsom signed his first pieces of legislation into law on Wednesday, and he chose to sign them at a school where the water contains a carcinogen and kids can’t even use the drinking fountains. Newsom opened his visit in a history classroom, introducing the bills to a room full of students at Riverview Elementary School in the Fresno County City of Parlier. “Shall we sign?” he asked, crouching down before the front row with a pen. “Yes,” they shouted, raising their hands excitedly. The laws pull $131 million out of the general fund for several projects, including emergency preparedness, as well as bottled water and other urgent needs for communities with unsafe drinking water. 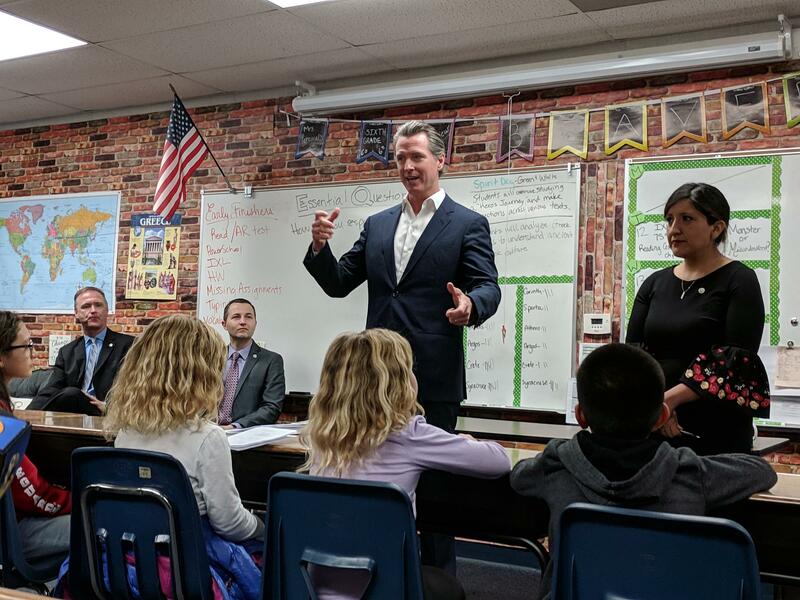 Appearing alongside State Senator Melissa Hurtado, representing the state's 14th district, Newsom first explained his new legislation to a room full of elementary and high school students. While in the Valley, Newsom couldn’t help but defend his decision announced during the State of the State address on Tuesday to scale back the high-speed rail project from statewide down to only the 170 miles linking Bakersfield to Merced. “I think high-speed rail creates a real opportunity for economic investment that goes well beyond just the issue of moving passengers from one part of the valley to another,” he said.